Our adventure talk series commences with a story of adventure, survival and a remarkable rescue. 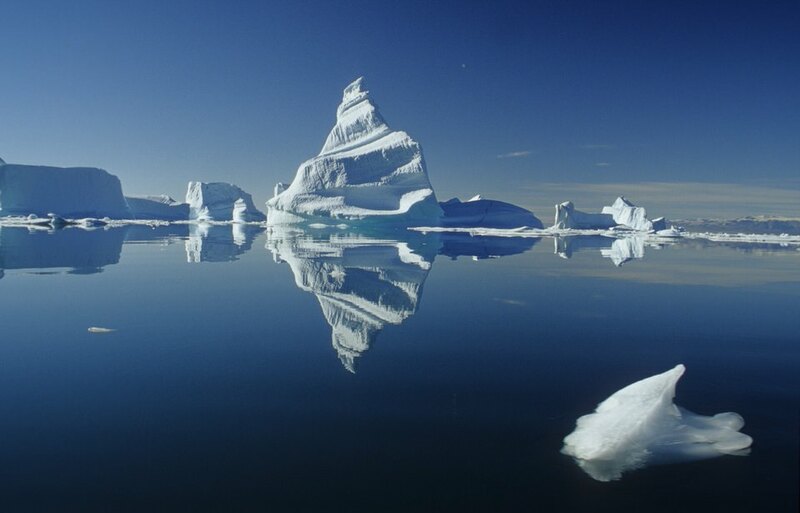 The crossing of Melville Bay with its 300 km long coastline of glaciers in north-west Greenland was the goal for Michael Kujawa and Markus Ziebell. However, on a small uninhabited island, they lost the kayaks and most of their equipment. Join Marcus to hear about their trip and a remarkable rescue by the local Inuit people. Our adventure talk series commences with a story of adventure, survival and a remarkable rescue. 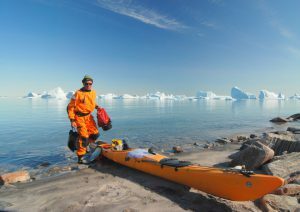 The crossing of Melville Bay with its 300 km long coastline of glaciers in north-west Greenland was the goal for Michael Kujawa and Markus Ziebell. However, on a small uninhabited island, they lost the kayaks and most of their equipment. With no way to contact the outside world and no food their trip of a lifetime quickly escalated into the challenge to survive. Join Marcus to hear about their trip and a remarkable rescue by the local Inuit people. REGRET this event is CANCELED due to the illness of the speakers partner. It’s easy to spend a lot of cash on equipment to help you to be spotted more easily. With a bit of prior planning and flexibility many options can be cost effective, if implemented when buying or replacing kit. This is one of the easiest to adopt especially when buying new kayaks and kit. If you want to know which colour is likely to be best on the sea, have a look at the colours used by search and rescue lifeboats and crew. In 2008 Rob Mosely carried out a surf ski rescue exercise in South Africa in “realistic conditions” (5-30 kts of wind and 1-2 m breaking waves) using both a helicopter and lifeboats. From the air the red kayak was always spotted first. The white kayak was also seen but the aircrew reported it was harder to see amongst breaking waves. To sum this up: the kayaks were easier to spot, the paddlers themselves less so. Bright colour schemes that contrast with the sea and backdrop give the most visibility. Adding day glow or reflective (SOLAS) tape increases visibility. If you already own a dark coloured kayak, vinyl graphics are worth considering and are available for sea kayakers http://www.artandsea.co.uk. Designs can be produced in a range of colours and even to your own specifications. This option is also worth considering, if you want a custom colour scheme when buying a new kayak. Spot the kayaks. Green may be good for smuggling but it is hard to see. At sea level you are the highest point on the kayak, so if you wear bright colours, you increase your chances of being seen by your group and others. There has been some research on the most effective colours to be seen on the sea but as a rough guide the brighter the better and you can get a good idea by looking at the kit rescue services use. Remember, if you end up in the water, most of your PFD is likely to be submerged so the arms of your paddle jacket may be the only bits visible. Many paddle jackets can also be bought with reflective tape which is very effective in poor light. The 2008 South African test found a paddler wearing bright clothing was easier to spot from the lifeboat. A brightly coloured cap, hood or helmet is very effective and will help maintain group control in rougher water when most of the kayak and paddler may be hidden by waves. Brightly coloured paddle blades can be very useful and often people may notice the paddle flash as light reflects off the paddle blade. Maine Sea Grant Extension College conducted extensive tests in the use of radar reflectors with sea kayaks to aid visibility with some surprising results. The report is well worth reading, if you are considering using a reflector . The higher the reflector the better. A stronger return signal was obtained when the kayak was side on or in a group. Around 1/4 mile range kayaks consistently showed up on radar, regardless of whether there was a reflector in use or not. 1 mile from the radar platform the sea kayaks were not visible on radar, whether or not they had reflectors. If paddling in areas where there are motorised craft, high speed ferries, large motor cruisers and rigid inflatable boats may be travelling at up to 44 knots. At 1 mile range they have less than 1½minutes to spot you on the radar screen and react. The South African tests also found that from the bridge of a high speed rescue boat – heading into the wind and swell – the spray and movement of the boat made spotting the kayaks difficult. In 2011 a high speed ferry travelling at 35 kts in fog ran down Les Marquises, a 9.5 m lobster fishing boat. The radar blip was visible but the boat was not spotted by the crew of the ferry. Between the first appearance on the radar and collision there was just 1 minute 41 seconds to react. <The English report can be read here. If the radar is not watched, the quality of the radar signal produced by a sea kayak is irrelevant. When kayaking in shipping lanes or places away from the coast or where other craft may not expect to find sea kayakers, assume you are invisible unless you tell other craft/coastguard you are in the area. It is also worth monitoring Vessel Traffic Services (VTS) when near commercial ports. Engine sounds can easily be missed depending on the wind and sea conditions. Keep your VHF switched on and keep it in a place that allows immediate access. If you need to increase radar visibility, e.g. in shipping lanes or in an emergency, the Maine research found an improvised radar reflector hat made out of space blanket style foil worked very well. 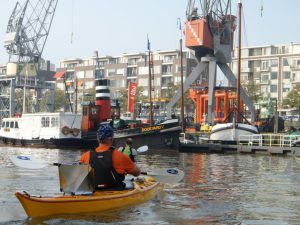 Dutch paddlers also report foil space blankets wrapped around a paddler will produce a stronger return signal. Foil blankets are reported to be very effective as a means of reflecting sunlight e.g. as a helicopter approaches. CD’s may be a cheap way of reflecting light but they de-laminate and are less effective compared to signal mirrors made of glass or lexan. Even on cloudy days signal mirrors will produce a flash and some writers report they will work with a bright full moon. In some countries they are a required item of safety kit. Read the instruction manual and practice using the mirror to get the best results. For both group control and safety it is important to consider how easy it is for others to see our small craft. Unless you are engaged in smuggling, invisibility is not an asset, especially if things start to go wrong and the group becomes separated. Whatever options you select no single solution will cover all situations. 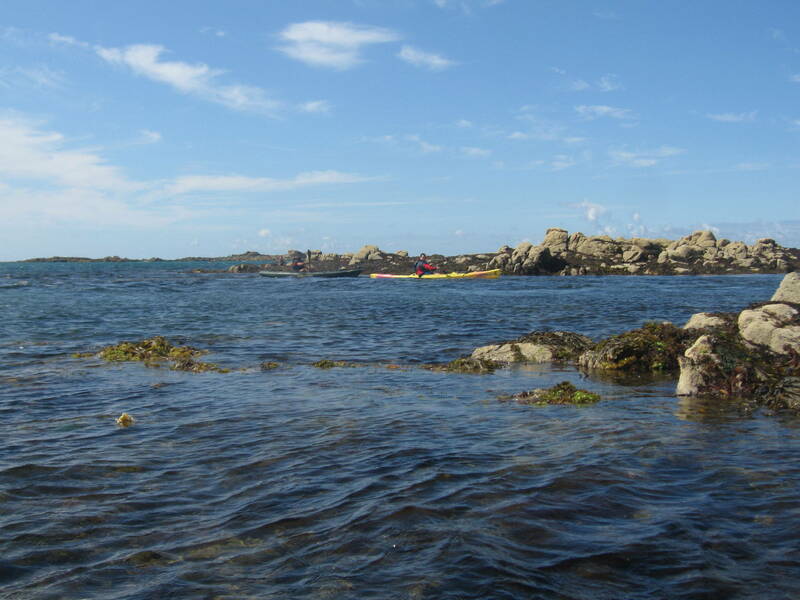 Consider the area you are sea kayaking in and also the type of trip and your group. While the ability to be seen is a vital consideration, some form of communication remains an essential component on any trip. 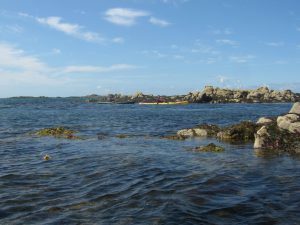 You’ll learn lots on our sea kayak courses and have an opportunity to test out some of the tips in this article. 2018 British Canoeing Kayak coach core training and discipline specific module (sheltered water) are now online. Option to run Sea Kayak Coach (old Moderate water) module if there is demand. Six months time-out under palm trees exploring the Caribbean by kayak. For Marcus Ziebell and Elke Grunwald a six month sabbatical turned their dream into reality. In February 2016 they set off on an almost 2000 mile long voyage through the Caribbean – from Grenada in the south to the Bahamas in the north. 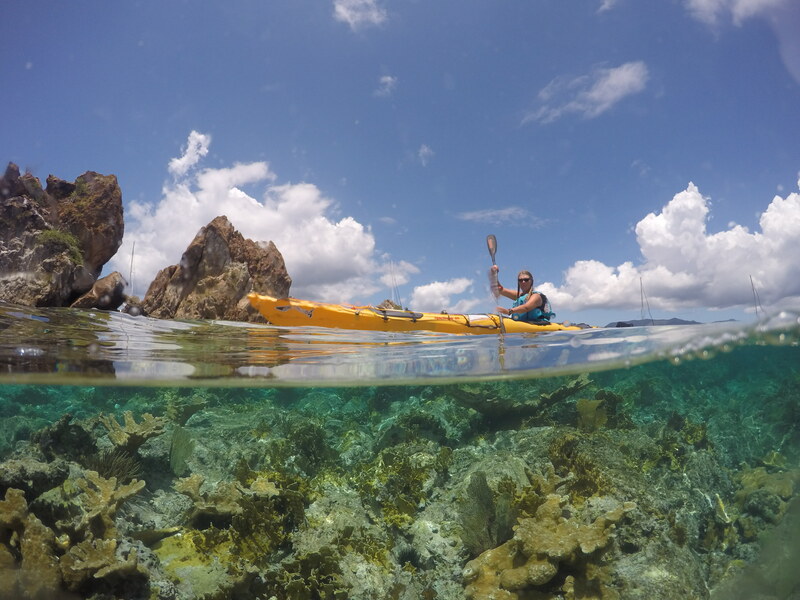 Through 14 countries and more than 100 islands they paddled the balmy turquoise waters of the Caribbean, studded with colourful reefs and impressive volcanoes. During their tropical journey they spent time with the locals and also explored many uninhabited small islands were they had to totally rely on themselves, sometimes for weeks. There they met the other locals, the sharks, tortoises, dolphins and other colourful residents of the marine reefs. Join us to hear their story. Wednesday 18 October 7.30pm. St Helier Yacht Club. Email to reserve your place. 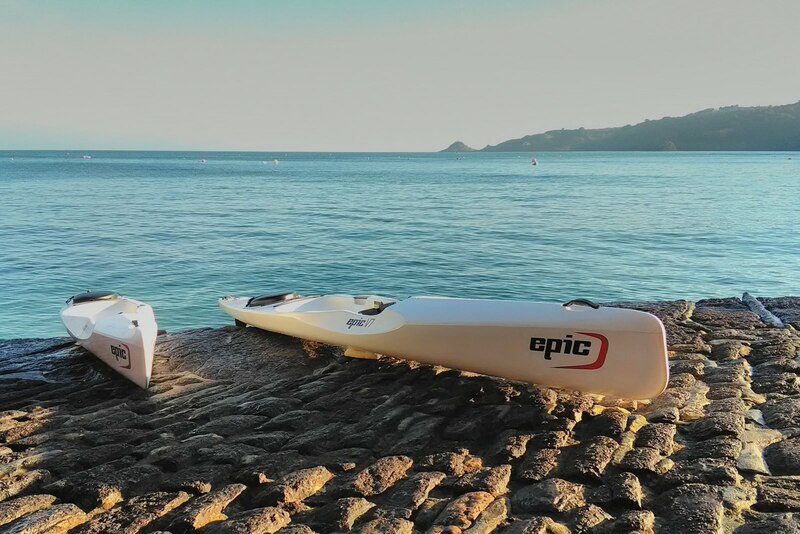 Reflecting the growing interest in Surf Skis we have added a selection of the world famous Epic kayaks and surfskis. Experience Epic V5 and V7 designs in Jersey. Day, half day and multi-day options. Reflecting the growing interest in Surf Skis we have added a selection of the world famous Epic kayaks and surf skis. Paddlers can now experience Epic V5 and V7 designs in Jersey. Epic kayaks push your paddling to a new level. 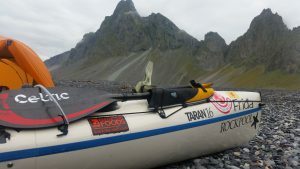 As well as a selection of Epic surf ski kayaks we also have high-performance sea kayaks produced by Rockpool and Tiderace. This gives paddlers a great opportunity to compare different designs and get advice from our staff who regularly paddle these craft. We also have a selection of Euro, Inuit and Wing paddles for clients to compare and contrast. 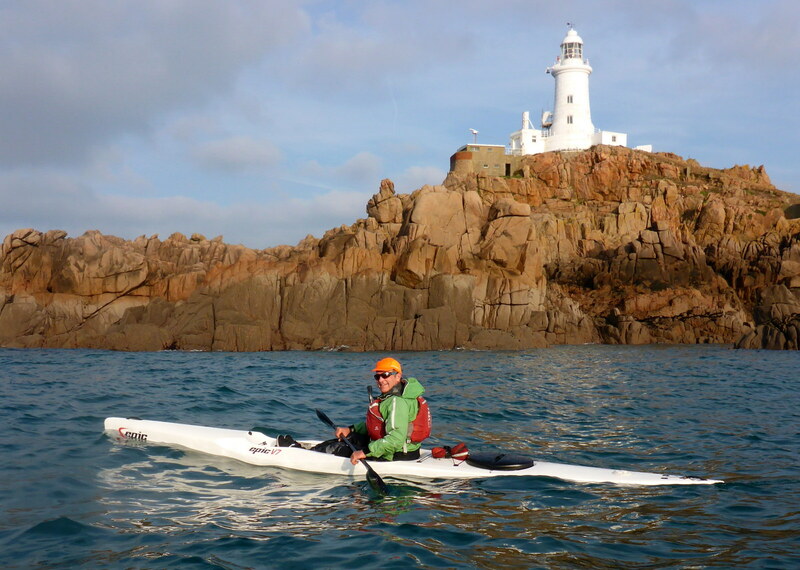 All paddle kit is supplied so you can maximise your time exploring Jersey, the island of the tides. Jersey is well served by Easyjet, BA and other airlines from Gatwick, UK regional airports and flights from Europe. Add the huge range of accommodation options and attractions and you can pack a lot into a short break to Jersey. 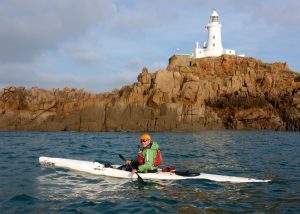 Kayak the excellent waters and coastline of Jersey -and even to the offshore islands- in high-performance Epic surf skis. Email Derek to book your Epic experience. Only a handful of sea kayakers have succeeded in circumnavigating Iceland by kayak. 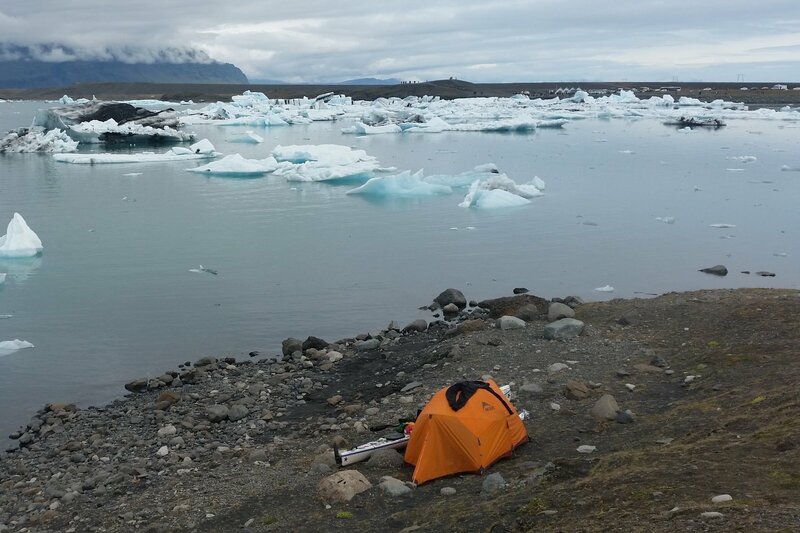 In 2016 Lee Taylor embarked on an epic solo sea kayak voyage around Iceland -the island of ice and fire. Join us to hear Lee present an illustrated talk about his 61 days (1000 miles) solo sea kayak expedition around Iceland. Saturday 18 February, 7.30pm at St Helier Yacht Club. Tatiana Cappucci one of Italy’s top sea kayakers, presents an illustrated talk about her 144 days (2207km) sea kayak expedition around the Cyclades islands. Saturday, January 28, 7.30pm. Advance booking is essential. Tickets £8. Buy tickets online here.